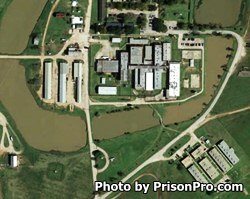 Scott Unit, formerly known as Retrieve Unit, is a mixed custody high security prison located in Angleton Texas. Scott Unit is located on over 5,780 acres of land, 50 acres of which are inside a secure perimeter that contains the majority of offenders. The maximum capacity of Scott Unit is 809 inmates in the main unit and an additional 321 offenders in the Trusty Camp. Offender custody levels range from G1 minimum to G4 high security levels (G4 offenders are usually classified as G4 because they have shown a pattern of violent behavior). Inmates who are located at the Trusty Camp are mostly low risk offenders and are entrusted to work in field operations, in facility maintenance, in the facilities kitchen and laundry services. The large amount of land Scott Unit is situated on allows for multiple correctional operations that often employ the offenders in laborious jobs. Inmates must meet certain criteria to be selected for job opportunities. The agricultural operations available at Scott Unit include a swine finishing operation, grain storage, field crops, a poultry egg laying operation, and raising cows and calves. Inmates have access to educational programs that teach literacy, adult basic education, and give an offender the opportunity to earn a GED during their incarceration. Additional courses available include the CHANGES pre-release program that helps prepare an inmate for an upcoming release, life skills classes that are taught by volunteers, and various support groups. Scott Unit holds visitation hours from 8am to 5pm on Saturdays and Sundays. Inmates are allowed a single visit up to two hours in duration each weekend. Scott Unit has both contact and non-contact visitation, your inmate's visiting status will determine which they are eligible for. Remember to always contact the facility before you visit to ensure your inmate is still located here and still has visitation privileges. Visitors are permitted to bring a small clear Ziploc bag with up to twenty dollars in quarters (paper currency is prohibited) to purchase items from the visiting room vending machines, at no time may they give the offender any money during a visit. Cell phones are not allowed in the facility.